Comfort is ideal; complacency is poison. Comfort is knowing that you both still love each other even after gaining holiday weight; complacency is steadily gaining without a care. Comfort is cuddling up on weekends with no makeup and ; complacency is constantly looking unkempt with no effort whatsoever. Comfort is understanding that they have to postpone your dinner date because you know they have a big, urgent account at work; complacency is indefinitely postponing dates that slowly fade out of conversation, and neither of you notice or care. Be comfortable in your relationship! Know that he still thinks you’re beautiful when you wake up on a Sunday morning. But don’t take advantage of your partner’s love and acceptance and stop trying to impress them or make them feel special, adored, and worth making an effort for. Never stop dating your partner. There are too many relationships based on this mistaken case of identity – someone falls in love with the idea of the relationship, not the actual person. You don’t love him – you love the feeling of getting roses sent to your office. You don’t love him for his personality – you love the presence of his name next to “in a relationship with” on your profile. You don’t love the time you spend together – you love the pictures of you as a couple that get you likes and sweet comments on social media. Pinterest is filled with dream wedding boards that belong to women who have every detail and aspect of their wedding planned and ready to go – all that’s missing is the man. Andthey are often the type of woman that joyfully dives into a new relationship with lots of social media updates and texts to her friends about the cute story of how he asked her to be official. There’s not much said about the actual man and their true connection, but there’s a lot said about his romantic gestures and her hopes for future romantic endeavors. 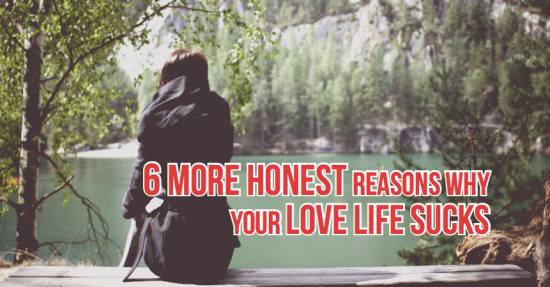 Examine your relationship and be honest with yourself. Are you here for the idea or the person? Rebounds – we’ve all had them. A rebound relationship can be a great (but unfair) way to move on from someone, particularly if that breakup really messed with us. However, a rebound relationship can backfire and leave you in a worse place than before on so many levels. First, you’re leading on someone who might be perfectly decent, loving, and really into you. You’re using an innocent for selfish means, whether it’s trying to make your ex jealous, show your ex that you’re “winning” by moving on so fast, or trying to soothe your own loneliness without true emotional investment. How would you feel if you found out that the person you’re dating and really like is only with you to show up his ex? Maybe he even likes you as a person, not just as an end to his means, but he thinks about his ex when he takes youout to dinner, he wishes it was his ex’s hand that he’s holding when he holds yours, and he wants it to be her that he’s falling asleep with – not you. If you haven’t gotten over someone yet, your new relationship won’t be able to thrive. How could it thrive if you’re constantly keeping tabs on your ex? You’re kissing your new beau but your mind is fixated on the picture your ex got tagged in with someone attractive. If your body is here, but your heart is elsewhere, this relationship can’t work. You’ve got one foot on the train but the other foot is still on the platform – decide where you want to go. This is one of the most pervasive, blatant, obnoxious, destructive, annoying, stupid, and hindering aspects of dating today. Playing the game. So many pointless rules that only frustrate yourself, your potential partner, and serve no purpose. Everyone is caught up in a vain and self-defeating contest to see who can care less –if he takes X minutes to response to your text, you have to wait X+10 minutes to reply to him; you can’t call her until at least two days after your date to show that you’re not desperate and that you have a life; you can’t double text even if you really want to talk because then you look clingy and like you have nothing better to do; you’re “talking/hanging out/a thing.” It’s an endless contest to “win” by showing that you care less than them. And you wonder why you can’t find and hold a good, strong relationship? It’s a frustrating cycle that leaves both of you dry and waiting – if you waited 10 minutes to respond, he’s going to take 15, so then you take 20, and on and on – so ask yourself, what is the point? Does it really matter it you respond right away instead of staring at your phone and waiting for the minutes to pass until it’s “okay” to respond? Maybe you’ll actually have a real conversation with good back-and-forth if you just respond when you see his messages.Sure doesn’t seem like “winning” if you’re losing the opportunity to create and explore a meaningful relationship because you’re busy following the rules of today’s inane dating game. In the beginning of a relationship, you tend to tiptoe around discussing serious or negative things. You’re careful not to burst the happy bubble, broaching such subjects with great care. Later on, you’re more comfortable and less sensitive to how they might react. The temptation to be passive-aggressive can sneak up on you. Maybe you’re both about to leave in the morning and this is the day that they’re finally asking for that raise. Don’t try to get them to buck up by saying, “And don’t be spineless like you usually are. Remember when your buddy kept borrowing money but never paid it back, but you were too nervous about conflict to confront him? Grow a pair for once.” If she just came back from a discouraging visit to the fertility clinic, this isn’t the time to say, “Aw, honey, I’m sorry, but you should’ve started working out with me when I asked you to and your body would be better prepared.” Read your partner and read the situation. Strive for a balance of the best timing, delicacy, and honesty in discussing things with your partner. After a while, it’s easy to move each other further down your list of priorities. There was a time when you’d duck out of a business meeting to send an immediate reply to their text. Now, you postpone a romantic dinner out so you can work late. 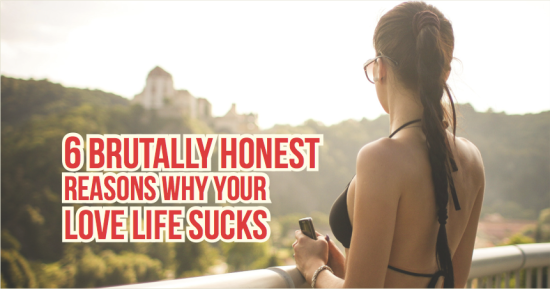 You lounge around in gym shorts and ratty T-shirts because they love you anyway. You accept favors from them without much of a thank you because, as partners, it’s expected that they help you out. Don’t fall into the trap of taking each other for granted. Say “thank you” with a big hug and kiss, wash your face and put on some makeup, make date nights a priority, and stop checking your email when you’re together. Always remember how lucky you are to have one another and express that appreciation. We thought it would be fun to do a Datevitation spin on Stephen Covey’s 7 Habits Of Highly Effective People, which we’re calling the 7 Habits of Highly Happy Couples. Block “Just Us” Time – We are all so busy these days. Work. Family. Friends. TV. The Internet. With so many things competing for attention and so few hours in the day, it is easy for weeks or even months to fly by without spending any quality time with your partner. That’s why Olga and I have a new tradition. The first Sunday night of every month is blocked off in our calendar for an evening with just the two of us. We discuss what happened last month and talk about the month ahead. This has worked wonders for our relationship, and I’m sure it would do the same for yours! Thanks for the great idea! Know The Words “I’m Sorry” – You’re not perfect. Nobody is. And occasionally you are going to screw up. When you do, say “I’m sorry.” But what is really difficult is learning to say “I’m sorry” when the situation isnot so black & white, and perhaps you are both at fault. It may feel good in the moment to have the scathing last word in an argument, but you can find even greater satisfaction in taking the high road by being the first to say “I’m Sorry.” By taking this approach, you’ll find you can often quell an argument that would otherwise escalate into a full-blown fight. Say Goodbye With A Kiss – Before you leave the house, give your partner a kiss goodbye. Everytime. It’s a sweet little gesture that only takes a second, and will leave you both with a good feeling as you embark on your day. This one is super simple so there is no excuse to not implement this habit immediately! Make Love Often – Intimacy is vital to any healthy relationship. Indeed, one of the best parts ofbeing in a relationship should be the regularity with which you can get it on Yet, so many couples let days, weeks, and sometimes even months go by without making love. So here’s an idea: Decide that making love will be a habit in your relationship. You can even block time for intimacy and put it in the calendar if necessary. Try New Things Together – Don’t be that couple that always goes to the same restaurant and makes “date night” seeing a movie once a month. You are unhappy because you are bored! Happy couples try new things, challenge each other, and like to get out of their comfort zone. As an example, Olga challenged me to face my fear of heights and we recently went paragliding together. She also bought us a flight lesson for my birthday. Conquering a fear with the help of your partner will undoubtedly bring you closer together. Be Each Other’s #1 – We have a lot of people we care for deeply in our lives. Our family. Our friends. Our community. But at the end of the day, there should be no doubt that you are each other’s top priority. Olga knows that she is the most important person in my life and that I have her back. I know she feels the same about me. Make it a habit, through words and action, to be each other’s #1. Do The Little Things – We always hear the importance of doing the “little things” — those actions that can take just minutes but will leave your sweetie smiling for hours. But happy couples actually do the “little things” and do them regularly. If you need ideas in this department, you’ll find a lot of step-by-step video guides to little things you can do today on our blog, including my personal favorites: how to put your own custom fortune in a fortune cookie (without cracking the shell) and how to surprise your special someone with a custom postcard (using your smartphone). Both of these examples take just minutes to do, and you’ll be amazed at how much happiness they can bring to your partner, and therefore, to your relationship. What do you think about this list? Can you identify any habits in your relationship that you think should be on this list? Please let us know in the comments below!